Granger & Co. | Abandon Spoon! This year my life was turned upside down with the arrival of my beautiful baby boy (I’m biased of course but he really is beautiful). While I was pregnant, and no longer able to drink tequila and stay up past 9pm without yawning profusely, I had to find another way to enjoy myself. Shockingly that pleasure became food! This time however in the form of brunch. I’ve always enjoyed a good breakfast, especially when hungover a full English really hits the spot. But now I’m appreciating a more sophisticated form of brunch and have been trying out lots of new places. I went to Granger & Co. (Kings Cross) twice while I was pregnant and both times I was not disappointed. The first time I went was a family affair, with my bf, brother, Aunty and cousins. These cousins are particularly difficult to eat with; one has a nut allergy, the other is vegan- severely reducing the amount of restaurants safe for both to eat. This place caters for both cousins proving an extensive and quirky menu. On this occasion I ate from the lunch menu having a big bowl of yellow fish curry, spiced butternut squash, roast peanuts, brown rice and cucumber relish. It was delicious and really filled me up. Although not so much that I couldn’t share a dessert after. The second time I went with my brunch partner in crime (ex shisha partner) and I was a lot more pregnant this time. Everything was taking me longer and all I wanted to do was sit around and stuff my face with good food. We went on a Friday afternoon and the atmosphere was very relaxed, a steady stream of young students (presumably from St Martins round the corner) sitting by themselves on their MacBook pros typing away and sipping coffee. 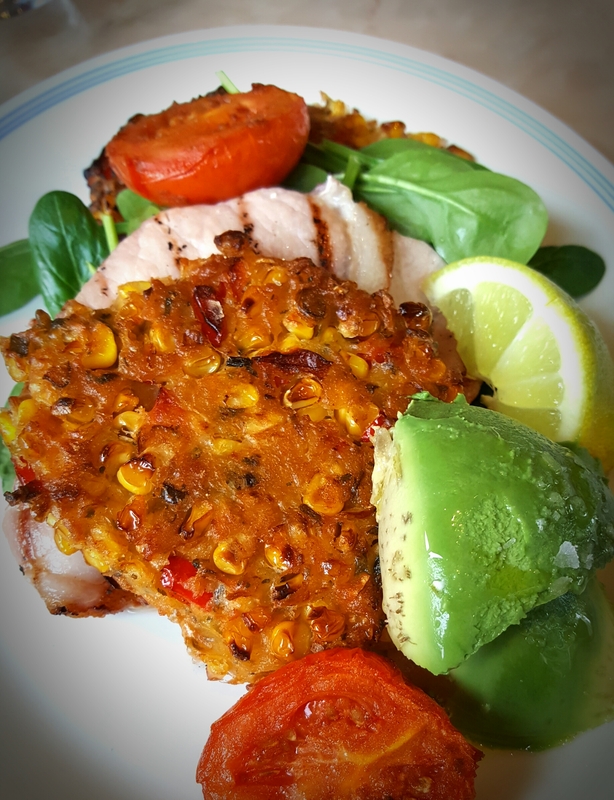 I ate the sweet corn fritters, roast tomato, spinach and bacon and I added extra avocado because you can never go wrong with avocado for breakfast. 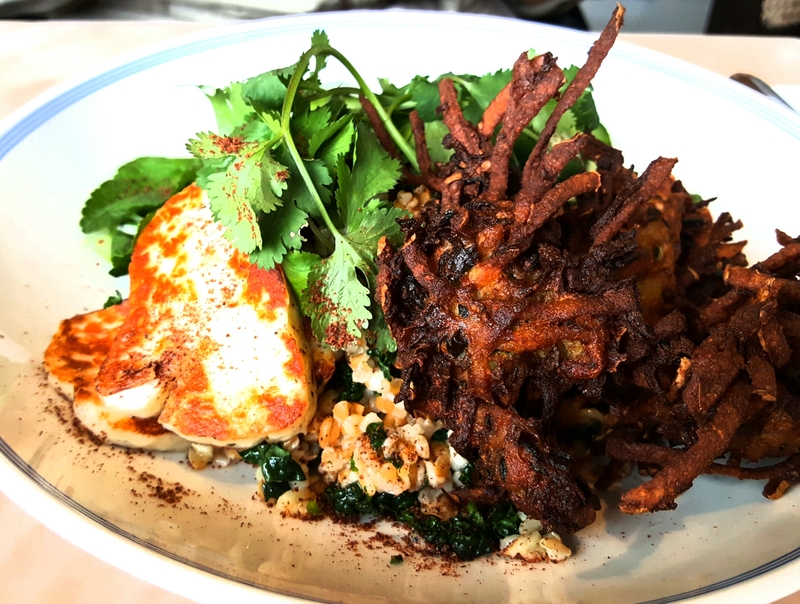 Tiya had the courgette fritters, halloumi, siyez and shredded kale salad, zhoug. Both delicious and making me really want to cook fritters at home. Although we were both really rather full from our mains we felt we had to have a cup of tea and dessert. 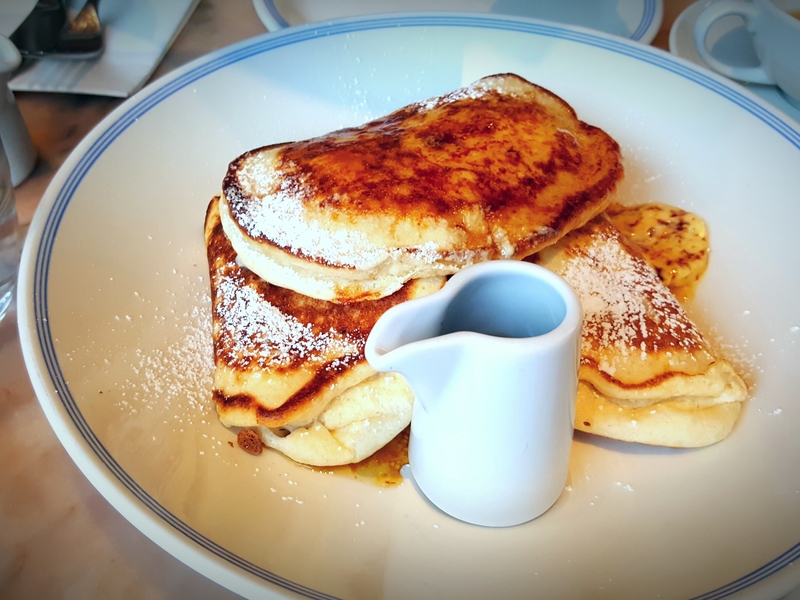 We had a suitable rest in between and then We had the ricotta hotcakes. neither of us particularly like banana so they kindly substituted for strawberries which worked beautifully with the honeycomb butter. Since having my little bundle of joy I haven’t been back, so I can’t comment on how easy it is to negotiate having a baby in the restaurant with me. I did see some mums in the restaurant with their babes but they may be experienced at leaving the house with a baby! For me it is still very much one step at a time, one day at a time. For other brunch reviews and write ups go to my newly added Brunch page.